↑ Jones, Alicia Noelle (2002). 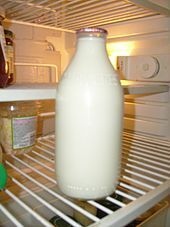 "Density of Milk". The Physics Factbook. ↑ "Milk, whole fresh cow producers". UN Food & Agriculture Organization. Retrieved February 18, 2014. ↑ "Milk, whole fresh sheep producers". UN Food & Agriculture Organization. Retrieved February 18, 2014. ↑ "Milk, whole fresh goat producers". UN Food & Agriculture Organization. Retrieved February 18, 2014. ↑ "Milk, whole fresh buffalo producers". UN Food & Agriculture Organization. Retrieved February 18, 2014. ↑ "Dairy production and products: Milk production". www.fao.org. Retrieved 2015-12-03. ↑ "Milk and milk product statistics - Statistics Explained". ec.europa.eu. Retrieved 2015-12-03. ↑ Introduction to Dairy Science and Technology: Milk History, Consumption, Production, and Composition, University of Guelph, foodsci.uoguelph.ca. Retrieved on ୨୧ ଜୁଲାଇ ୨୦୦୯. ↑ Livestock Production statistics, FAOSTAT, Food And Agricultural Organization of the United Nations. faostat.fao.org. Retrieved on ୨୧ ଜୁଲାଇ ୨୦୦୯. Carroll, Aaron E. (November 17, 2014). "Got Milk? Might Not Be Doing You Much Good". The New York Times. Retrieved November 18, 2014.